This is a seriously good bike at a seriously great price. We already knew the MT-09 platform had shades of greatness. With that stonking triple’s fuelling ironed out it’s status is confirmed: it’s both immensely versatile and thrillingly invigorating. The chassis, now the fork settings have been tweaked, is without criticism. The Tracer now adds to that with decent range and comfort, excellent all-round ability and impressive spec and sheen – without hurting that value at all. It’s great fun, characterful, useful and a bike for all reasons. It was because of this that it became a leading contender for 2015 Bike of the Year. Criticism of the stock MT-09’s slightly soft forks has been addressed by increasing both the front and rear preload and damping rates on the new Tracer. As a result, the chassis just gets on with it. The ride is stable and plush enough; the steering sharper and lighter than most and even when pushing pretty hard through the snaking switchbacks and swervery in the mountains above Marbella, the suspension and brakes were never found wanting. 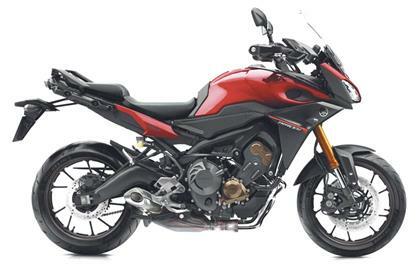 In other words, if you wanna behave like a pillock, the Tracer will wheelie until the cows come home – it retains all the fun and zest of the base MT-09. If you wanna take your partner and a week’s worth of gear to St Tropez – AND have fun through the twisties on the way down – it’ll do that with ease too. And, come to think of it, if you want to just have a damn good, fun, truly all round motorcycle, the Tracer’s probably got virtually everyone beat. The compact and impressive ‘C3’ triple is essentially identical to that of the base Yamaha MT-09 introduced earlier this year but with slightly revised and updated mapping to the different mode settings. 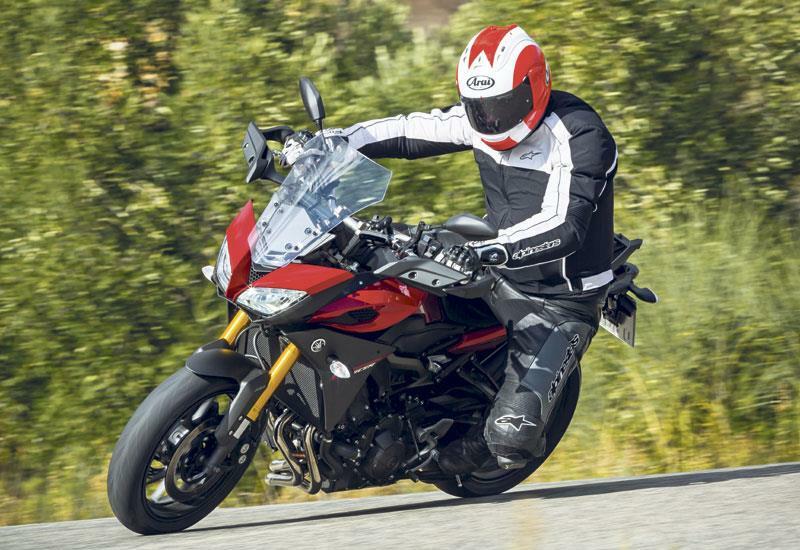 As before, three modes are selectable: ‘Std’ (which has been softened off slightly compared to the MT-09 for this sport-touring application), a sportier ‘A’ mode (also improved, after original complaints, for the 2015 MT-09s) and a 95bhp ‘B’ or rain mode. You can switch between all on the move with the throttle is closed.‘Std’ is fine, 90 per cent of the time: a class-leading 115 horses and, better still, an utterly linear, meaty, addictive drive from 3000rpm all the way up to around 10 or 11. From 5000rpm the exhaust note changes, churning into that distinctive three cylinder wail that addicts and excites. If it rains, knock it into 95bhp ‘B’. And if you really want to thrash and scrape, ‘A’ mode adds a little sharpness to the response and meat to the midrange, enough to to have you snapping at the heels of all but the fastest super nakeds. Boy, I love triples. This is an affordably-priced machine – but it certainly doesn’t appear ‘cheap’. The fairing is cleverly comprised of lots of different ‘modules’ (rather than flat panels) and incorporates a variety of different, finishes. Screen is manually adjustable through 30mm via two tightening knobs inside the fairing (although it can’t be done on the move) plus there are adventure bike-style hand guards. It’s a well-specced, well-finished machine. The MT-09 Tracer will cost, if you hadn’t already heard, when first available in UK dealers not much over £8K. To put that in some kind of context, that’s over two grand less than Honda’s similarly-targetted new VFR800X Crossrunner, over £1500 less than Kawasaki's updated Versys 1000 and 1850 squids under Suzuki’s fairly prosaic V-Strom 1000. And the new Yamaha is probably faster, more fun and more versatile than all of ‘em, too. A new, stylish fairing and adjustable screen gives the MT weather protection to match most up to 1000cc and a wholly new, adjustable saddle and rear sub frame to match, transforms it into a genuine two-up machine. A bigger tank and uprated equipment, including a new, posher dash and a centre stand, gives the Tracer the kind of long distance ability and class any credible sports-tourer demands. Front brake 2 x 298mm discs with four-piston monobloc radial calipers. Rear brake 245mm single disc with single-piston caliper. 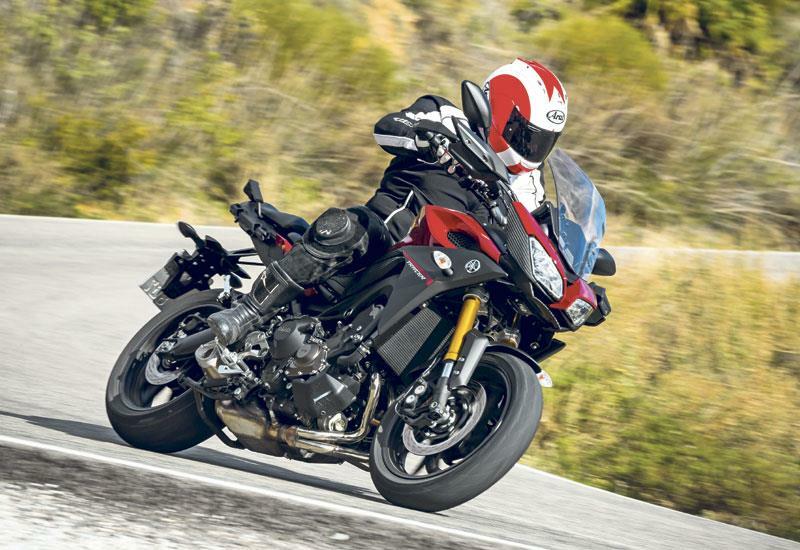 22 owners have reviewed their YAMAHA MT-09 TRACER (2015-2018) and rated it in a number of areas. Read what they have to say and what they like and dislike about the bike below. The motorcycle appears good at a glance but it is not good upon closer inspection. The parts rust very quickly even when pampered. The brakes literally locked on my brand new Tracer a month into owning it. The bike periodically sputters and acts weirdly. Take it to dealer and they can find no fault. This is a brand new machine and it is a total let-down. The throttle is very snatchy and never runs smoothly. I guess Yamaha only knows two throttle positions, closed and open. This is my first brand-new bike and I am very let-down. I regret buying a Tracer. Throttle is garbage. Hunts for rpm all the time. Never rides steady. It blows! Brand new brakes stuck. Parts rusting on brand new bike even when taken care of properly. Too many repairs on a brand new bike. The quality is very plastic. My dealer is wonderful. The bike is garbage. I had a standard MT-09 before this but wanted more tank range and some weather protection so bought the Tracer. Since I bought it in May I've done nearly 5k and enjoyed all of them, whether touring or scratching. You can thrash it like a two stroke when you want to play racers or it's just as happy short shifting and dawdling along when touring, an absolutely beautiful engine. For me it had a few minor issues as standard. The screen created a lot of noise regardless of which helmet Inwas wearing somI changed to a Puig touring screen and it's now great. The seat was a bit firm so had it fitted with memory foam and it's good for 500 mile days now. Most of these are issues that lots of bikes suffer from as standard so can't understand a lot of the poor reviews. For the price the bike is a bargain. Standard suspension on the early bikes like mine is not great on rough roads, same as the early MT-09's. The new ones seem to be very good so they've obviously listened to complaints. My bike came with Andreani fork cartridges and Ohlins shock so is pretty good now it's all set up properly. Brakes are excellent and even the back one works well. Star of the show, really can do anything and sounds a treat when being revved hard. Overall the bike is well built and finished. There's odd little things like cheap badges on the fairing side panels that let it down slightly but minor stuff really. Reliability has been 100%, nothings come loose, broken or fallen off. More than can be said for my mates BMW S1000XR that's been recovered twice so far and cost double what the Tracer did. I do all my own servicing and everything is fairly easy to access on the Tracer and parts are cheap enough. Tyres and chain seem to be lasting well and excellent on fuel consumption averaging 58 to the gallon. Pretty well equipped as standard. Nice dash with plenty of info even if the full gauge is a crap design showing full until you've done about 110 miles then drops to half full. The Tracer 900 does it all, with style: Take it for an easy stroll around town, or head across the continent to hunt for twisting roads. The engine is pure fun, with plenty of power from low to high, and the triple engine's sound is plain addictive (more so with the Akrapovic exhaust). The only thing you cannot expect from this bike is that it is a market leader in every section. (Very) wide handlebars, a twitchy but tameable throttle, neutral yet active sitting position. It takes a while to get fully acquainted and at ease on the Tracer, but once you do, it's all confidence. I've taken it to the track and to twisty roads, where the engine really sings, it's then that you feel it's an adaptation from the MT09. The seat is quite hard, which counters the "sinking in" feeling, but after 2-3 hours, you'll want to take a break for sure. I'm most definitely not alone in saying this is probably one of the funnest engines on the market. The triple cylinder handles it all, with loads of torque and a huge range, and 115bhp, you won't mind making a detour now and then. After 17.000km, I have yet to come across any sort of downfall. I must admit I'm quite a maintenance nut, so I leave little room for error. Nothing particular to report. Yamaha isn't too expensive, so expect no surprises. The standard Dunlop tires are so-so, I'd recommend getting a set which suits your style from the get-go. I went with the Akrapovic exhaust which Yamaha offers, and I'm still grinning a lot when above 7000 rpm or when downshifting. I expected a bit more. I bought early 2015 bike in a stupid silver colour with blue wheels, blue forks and violet(!) rear shock spring. Someone in Japan was probably on drugs to think this is attractive or pretty. I stripped the bike down and resprayed it. This actually revealed how cheap feeling certain parts of the machine are, but it mainly relates to bodywork. Mechanicals and electrics are solid and cleverly designed. After the first two longer trips in the UK I wondered why it was 'Bike of the year 2015' - suspension is soft, slow constant speed is not smooth, seat is too hard, screen doesn't work very well, handlebars are too wide, fuel gauge has no logic, original tyres are rubbish. In summer all your controls and every bodywork gap is full of insects - half fairing doesn't protect any of that and isn't easy to clean (not sleek). On the other hand its engine is fantastic, riding position is great, resprayed bike looks good and you can push hard or go touring or both. Brakes are very good. No doubt. But suspension is a bit to soft. It has awful whine sound in 6th gear around 55mph where you use it the most. Maintaining speed around 25-30mph is not smooth and it somehow judders. On the other hand it is very light, flickable, stable fully loaded two up as well as solo. Because I ride my motorcycle two up TC steps in very often. Especially two up Traction Control is very brutal as it cuts engine off under smooth but hard acceleration and in combination with soft suspension it unsettles the bike and pillion bashes into me from behind. Engine is pretty much perfect! Bodywork is a bit flimsy but rest of the bike is well put together. There are gaps between fairing and headlight which are filling with insects and dust. It is seriously very good on petrol. Bike was designed to do a lot of things without being too expensive and it works. Again I'm asking why! Why the hell someone decided that there will be only one bar in fuel gauge for the first half of a tank??!! Until you reach half a tank you don't know if you are still full or 3/4 or close to 1/2 tank. This is especially annoying when you ride with friends and you all want to start with full tank. This is also annoying when you wish to avoid fuelling on motorway and plan your stops. That bloody gauge shows average and current fuel consumption but doesn't show how many miles remain to empty tank - very useful feature on touring bikes with fuel range of only 170 miles. You can turn your traction control off but when you stop for petrol or a fag it comes back on again. Screen and half fairing doesn't provide much protection. Handlebars are very wide and have extra 2" on each side past your grips - makes it very difficult to filter through traffic. LED headlights are great, central stand is very handy. Test drive from West London Yamaha was not so great because I could only follow their apprentice on less powerful motorcycle around town for 30 minutes and had to wait for seller's attention for 25 minutes. They were short of staff. Looks good, performs terribly. Tries to be a jack of all trades, master of none. Read all the reviews and did the test ride. The short swingarm flattered and deceived. Poor sports bike, awful tourer. Awful screen. Appalling suspension, too hard on bumps, too wallowy, verging on dangerous on fast sweepers. Brakes ok.
Pretends to be fast, but isn't once you get past the light front end. A 675 would be quicker and better in most situations. Some furry nuts after a short time, chrome decals would catch on a cloth and try to rip off on the fairing, cheap and tacky. Besides the USB port, there is none. Bill Smith's was eager to sell, but not keen to take it back on a trade three months later for an explorer. I took it to France and then was sick of it by then. Ended up going elsewhere, won't be back to Bill. I could not recommend this bike to anyone unless they want a budget commuter. As an all rounder in succeeding at only one thing, being poor at everything. I thought it would be a sporty bike and a capable tourer, it was far from either. The rubbish, verging on dangerous suspension and the awful tank range saw to that. The fuelling was absolutely horrendous. I had an '05 R1 and '14 explorer before. Appalling suspension, brakes ok. Large fast sweepers.... very big wobbles. Not a bike for a back box for sure. Suspension was the worst I've experienced on a bike, either solid and jarring over bumps or squishy and unstable over fast stuff. My 2002 TDM was better. Pretends to be quick, but isn't really. Rusty bolts after first spin, but in general not bad. The shiny metallic decals on the fairing were very cheap and would snag on polishing cloths if you weren't careful, pulling away from the plastic. Very cheap and nasty. Only made the first service before I couldn't take anymore. Got 51 mpg average but the small tank and very silly fuel indicator meant you had to refill every 90 miles or so. There is plenty of room for a bigger tank and they didn't even address it on the GT model, pity. You have to buy everything. Very basic bike as standard. OE tyres are not good. Wind protection was terrible and overtaking lorries required more care than it should. B.S. in Chester had no interest in taking the bike back as a trade so I went further afield. Quick enough to take your money, but not too quick to help you out when you find out the bike is not what you wanted. Needless to say, won't be back there again either. After a trip to France and refuelling at every stop: I got home and traded it for a '17 explorer. Bye for now yamaha, call me when you find your mojo again. Can you have a more fun, versatile machine for less? The suspension isn't the best but the thing cost me £7k virtually new, so what do you expect. Perfectly acceptable and absolutely fine. Screen won't stay locked but other than that, all is well after 2 years and 5k miles. Ready, Set, Go! The FJ09 is Eager to get you there! It rides great. It's not great at anything specifically, but it's really really good at just about everything. It's light and nimble for curvy roads. It's comfortable for long hauls (could use a more padded seat). It's torquey in every RPM range for quick passing on the highway or off the line. There is some room for improvement in the brakes if you're an aggressive rider. Can I rate it 10 out of 5? This engine is insane in every range. I'd probably kill myself if I had any more power. Why buy bikes with huge heavy engines when you can get so much performance in this small triple package? The bike as a whole is a great value for the performance and features. I think most of us that bought it were intrigued by the price tag as we looked at other comparable bikes that had been on the market longer with great reputations like the Versys, and V-Strom. I love the standard 12v outlet for charging phones etc... Obviously ABS is great to have. I like the Yamaha bags that clip right on to the bike and the bottom mounts for them blend right into the passenger pegs, so you can ditch the bags and the bike still looks clean; no wire frame brackets hanging off the sides. The bags are basic in design, and hold almost as much as small carry-on suitcase. I just wish the bags were color-matched or had some kind of design on the sides other than plain matte black. I bought from a dealer. I wanted the red, and they had just sold the floor model I had been eyeballing for 3 months. They found another one out of state and shipped it in and assembled it for me in a few days. Centerstand and gripheat is perfect, but the original panniers are not sufficient enough for long range travel. The panniers and rack vas offered for half price. Brilliant engine, very responsive with great torque all the way through the rev range. Let down by stock suspension, front fork springs too soft and rear shock too stiff with not enough adjustment. Had mine fitted with the basic Ohlins kit consisting of fork springs and oil and rear shock, kit cost £500 and £100 to fit. I've never ridden with aftermarket suspension so I didn't really know what to expect, the transformation is incredible. It is ultra stable at high speed now where it wasn't before and stability under braking has massively improved and the cornering is incredible, i can get this thing around corners with more confidence than my GSXR gives me. Brakes really are very good indeed, change the front fork springs to stop the bike diving under braking and they feel twice as powerful. Stock screen actually works well for me but I changed to a Puig short screen and this is perfect for summer use. Wear ear plugs and use whatever screen you want, can't understand why people don't wear them and then complain about the wind noise caused by the screen! Torque, economy and overall performance is perfect, 'A' mode is a lot of fun on the move but around town 'standard' is the mode to use. Build quality is very good overall. You can easily get over 200 miles out of a tank of petrol before it hits the reserve, I average 62 miles to the gallon and I don't hang about, you don't need to race through the rev range because of the amount of torque available from very low down. It's all good, fit Yamaha heated grips for the winter they are the best I've used and all controllable through the instrumentation. Crescent Yamaha, simply brilliant service. Great product overall let down by appalling suspension and Yamaha customer services. This is a fantastic bike which is let down by appalling suspension. Yamaha refuse to acknowledge this and their customer services are dreadful. One very disappointed owner who will not buy Yamaha again on the strength of that alone. Suspension appalling and not fit for purpose. Bike should not be sold with such poor suspension. it doesn't matter where you set the limited adjustment, the bike crashes and jars over bumps. Brakes are adequate. Seat is uncomfortable after 20 miles on a run. Excellent engine with power everywhere and excellent economy. Overall construction seems good for the price bar the suspension which is dreadful. Optional heated grips look good on paper but useless in practice as whilst you can barely feel the heat in the left grip, the right ends up almost too hot to touch. Comprehensive dash with fuel computer which offers integration of optional heated grips etc. Power mode switch is brilliant. Standard tyres not great. Did I mention suspension...? Dealer was excellent overall. Yamaha appalling. Great value all round bike. Comfortable all-rounder. Poor throttle map. My right wrist hurts - due to constant heavy grip of throttle. Great seat, very comfortable. Stock windscreen too small. Had to call out RAC due to flat battery a month after purchase. Figure due to astronomical first service cost. Fully specced LCD display. It comes with a main stand! Great price from Fowlers in Bristol, knowledgable staff, high priced first service. Best feature the size to power ratio. The screen is useless, I upgraded to a Givi and far better wind protection. Downsized from a Triumph Tiger 1050. The Tracer puts out the same power in a smaller bike and I find it easier to manage. My wife also says that it comfier as a pillion. Looked at a Tiger 800, but this is cheaper, and got better trade in, the difference was about £1100. Economical to run. Superb bike, really love it, brilliant engine, great comfort and value for money. Has the worst standard screen imaginable though, awful buffeting, easily sorted with an aftermarket screen. I am on my third aftermarket, the only one that really works is the Puig touring screen with the wind deflector thingy at the top. For a bike at this price, its excellent, I have done 450 miles in a day, stopping only for food and fuel, really comfortable, relaxed riding position, Does about 180 miles on a tank if ridden normally, a bit less if you're acting the maggot. Handles really well, no bother if you want to go scratching and will wheelie all day if you want. Its a bit flighty at speed, but I quite like that now that Im used to it. The engine is the best thing about the bike, bags of torque and great fun. 7000 miles done so far, including 3,000 in the Alps, it still looks and rides like new. Fantastic bike with an equally fantastic price, so far have done two European trips and i cannot fault this bike. I cannot really find any faults that are not so petty that i would not bother to mention them. Again I cannot fault either the ride quality, or brakes I do ride the bike with spirit on occasions, plus in comfort mode when touring and this bike has never failed to keep me smiling. Great engine, but I am greedy when it comes to power, and I would always like some more. But I really cannot fault this beauty it really is not lacking in the real world. I still cannot see how they can build such a high quality bike at this price. So far no signs of any corrosion, but I do not store the bike outside. I gave 5 out of 5 and I stick by that, Excellent engine with great power delivery. cannot believe than can make them for the Money great build quality really solid and feels you with confidence. Best features for me are, digital dash, superb led lights, centre stand and the one and only thing I will be changing is the standard screen. I am a stocky chap and I think the touring type option would be better deflecting the wind off me. For me the Tracer is a really comfy bike, the riding position is good giving the rider a very good view of what's ahead and for me gives me great confidence to really ride this bike. The brakes are really impressive to. Can't wait to try this bike two up. Great engine with a great sound. The different modes available to the rider really do make a difference and with plenty of torque and power available there's no need to down shift you can just roll the throttle on and the Tracer just goes and goes. This Tracer of mine is only 5 months old and covered just 1500 miles, so obviously there are no signs of corrosion and as yet it hasn't broken down or let me down. With servicing intervals being every 6000 and the big engine valve service being at 24000 for me this is great as I would generally only cover 2000-2500 a year. So for me each year I will be taking it to the supplying dealer for an anual service until the due mileage services need to be done. My favourite feature of the Tracer for me is the digital dash display. It's display carries so much information for the rider. It's very clear and easy to read with buttons at your fingertips to access other menus and I love the message it displays when you switch off " see you next time"
I purchased mine from a dealer, the price was a tad over the listed price but it has got a nearly £1000 Akrapovic exhaust fitted to it. Sounds awesome highly recommend this. I have full Akrapovic and Yamaha spot lights, Yamaha comfort seats, Gilles levers, a Shad rack and 50 litre back box. Got this racing blue version from a Yamaha dealer with all the accessories already on it with only 250 miles on it, so not even run in or a month old at £8499 but traded in my old 2003 VFR and paid 6399 for basically a new bike. I commute on my MT-09 TRACER from near Guildford into the City of London, it has great weather resistance behind what is a fairly small screen and well thought out body work. It travels up the A3 very solidly even in a reasonable wind. Once into London the light weight, torquey and brilliant triple enable me to manoevre quickly and safely, shortening my journey time across London. No problems to report. Build quality seems great to me. It looks great, It performs brilliantly and makes me smile a lot. The only negative I can find with this bike is the wind noise created from either stock screen option. You get what you pay for. I only got my licence 14 months ago, so I can only compare to what I've experienced in that time. Comapred to a K8 Bandit the brakes are magnificent and it's as light as a feather. The seat can start to feel a bit uncomfortable after a couple of hours. Suspension is ok. Love the upright ride position. I just love it. Torque all over the place. No need to carefully select gears like I did on my Bandit. It just goes like stink regardless of gear. Confidence inspiring for overtaking. Didn't think there was much difference in the throttle modes, but I do notice it being a bit snatchy in town or when filtering in A-mode. B-mode is a bit...laggy. But I suppose that's what it's meant to be like. Considering an Akrapovic exhaust to beef up the sound. Had the bike for nearly 3 months and no issues. I had the throttle stick for a while, but that was down to a poorly-fitted set of heated grips. Not going to blame the bike for that. I obsessed over the MPG rate when I was running the bike in..."Woo-hoo 80mpg!" But as soon as I was safe to crack it open...who cares about mpg rates?! Took a couple of months for my panniers to arrive, but the guys at Alan Duffus in Kirkcaldy always treat me well. Good discount on an Akrapovic is most welcome. Love it - love it - Never thought I would depart from the in-line four but the triple is fun. Howling sound track and effortless 1st & 2nd gear wheelies. The electronics package is brilliant for me as I'm not a natural bikist I have to work at it and still learning my limits. Roomy, comfortable great seating position with outstanding slow, tight-space manoeuvring abilities. There's a poor camber mini roundabout in Aviemore that I've never been comfortable on - till now. Delighted with looks ( very objective). The LED headlights are very good. The fuelling is not an issue a little snatchy at low speed but you can quickly ride to accommodate it. Only had it two months so reliability is unproven but NO problems yet - The build quality is excellent - Feels like solid quality parts NO rattily bits. Great electronics package - Some say there's little difference between the power modes but I disagree I like the 'B' mode for wet weather I feel it helps - The clock set-up is just the dogs, excellent clear display with lots of information ( disappointed there's no fuel range information though) - The gear indicator is handy - The seating and luggage layout is practical and comfortable with adjustable riders seat at 6'3" I set it up to max first thing - The LED lighting is very good the headlights are SUPER bright and white clever stuff - The small fairing and hand guards are very clever indeed giving excellent protection I don't know how that works.